In a medium sauce pan, combine Pomegranate Glaze ingredients and cook over medium heat. Reduce mixture by 30 percent. Strain and cool the mixture; set aside. Toast the caraway seeds, coriander seeds, cumin and garlic powder in a dry pan until fragrant. Add remaining Harissa Steak Sauce ingredients, except the chives, and bring to a simmer. Simmer for 10 minutes, remove from heat and let cool. Stir chives into finished sauce. Grill the steaks over a medium high fire until lightly charred on one side, approximately 4 minutes. 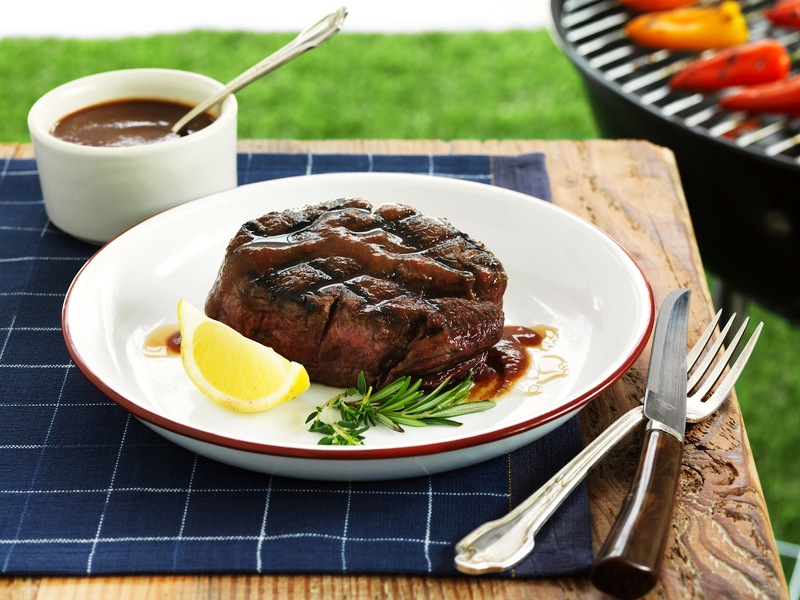 Flip the steak and baste with the Pomegranate Glaze. After an additional 2 minutes of cooking, baste the steak again. Remove the steak from the grill and allow to rest for 6 minutes. Baste the steak again after resting and serve with a side of the Harissa Steak Sauce. All these steak recipes are making me wish I could have a cook out!